The Mormon Church's Family History Library, located in Salt Lake City, Utah, just west of Temple Square, is the largest genealogical library in the world. Many people wonder why it is that The Church of Jesus Christ of Latter-day Saints is so zealous in doing family history work. The answer lies mostly in the vicarious work done in Mormon temples. Through family history work, members can find the names of ancestors for whom they can receive the ordinances necessary for salvation. The Family History Library was founded in 1894 to gather genealogy and help members of the Church do their family history work. Like any other library, it is open to the public at no charge, and 1,900 people or more visit the library every day. The library grew quickly from its start in 1894 and by 1938, the new technology known as microfilm was introduced at the library. The Family History Library now houses over 2.4 million rolls of microfilm records. The library began as a public institution, but in 1944, it became completely funded by the Church. In the 1960’s Church leaders saw that computer technology would be beneficial in record keeping. They hired computer experts and bought a computer. By this time space was becoming limited. In 1963, the Church completed the Granite Mountain Record Vault, in the mountains of the Salt Lake Valley, which became the storage facility for master copies of genealogical records. It was built with the best preservation in mind, and is designed to withstand even a nuclear blast. The library's collection and number of patrons has continued to grow. In 1980 plans to build a 142,000 square foot library with five floors was announced. The building was designed specifically to control humidity, temperature, and lighting in order to protect the collection from deterioration. On October 23, 1985, the new building was dedicated and opened to the public. 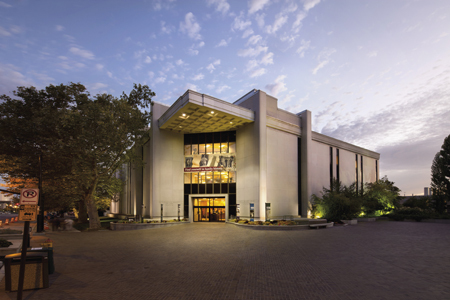 The library currently provides 2.4 million rolls of microfilm; 742,000 microfiche; 310,000 books, serials, and other formats; 4,500 periodicals; 700 electronic resources; 202 computers; 509 microfilm readers; 36 microfiche readers; 125 full time and part time staff; and 400 trained volunteers; as well as classes on genealogical research and how to use the programs and machines involved. The Library has obtained most of its records in the form of microfilm. Volunteers are currently filming records in over 40 countries. Some records are donated and others, such as Census Records, are purchased. Much of what is available at the Family History Library can also be found online on the Church's Family Search website. In 2010 the Church opened a new Family Search Library in Riverton, Utah. Riverton is at the very south end of Salt Lake Valley. The library is a state-of-the-art family history research center equipped with a treasure trove of tools and resources. The new library "replaces 24 smaller family history centers that had been operating in Latter-day Saint stake centers (meetinghouses) in the southern part of the Salt Lake Valley until earlier this year. Consolidating the smaller centers into a larger facility will enhance the experience of patrons significantly. In the new library, visitors will enjoy extended hours, broader research assistance and access to significantly more genealogical resources." The library and its resources are available free to the public (a small fee may be incurred for computer printing or photo copies). Patrons are invited to participate in free training and research classes. In fact, the library is equipped with a state-of-the-art computer training lab and four multipurpose training rooms. This page was last edited on 29 November 2015, at 09:48.